A farmer’s daughter, Marie grew up in a very rural area of Devon 10 miles from the Cornish boarder, forming a deep love of the moors and coasts and their ever changing moods and atmospheres. Her mother passed onto Marie a number of practical crafts and skills and with a keen interest in creating and up-cycling, in the 90s Marie pursue her interests and gained City & Guilds Creative Skills Certificate in Textile Decoration Techniques. Inspired by her achievements and keen to develop the artistic possibilities, Marie started working for Cornwall Adult Education teaching rag rugs making, felting, mosaic and textile crafts and achieving a Certificate in Education. It was whilst working for the service that Marie was first introduced to glass fusing and she quickly became irresistibly drawn to the unique and intriguing properties of glass when combined with the elemental force of heat Further study at Plymouth College of Art using a range of glass and metal applications and taking on teaching glass fusing in addition to her other skills, Marie began selling her art works at local craft fairs and art and craft exhibitions. Often seen at Bude harbour lending a hand with her partner’s fishing boat, Marie became aware of the development of the Old Forge into craft units and grabbed at the unique possibility this could provide as a studio where she could work and offer her art for sale. 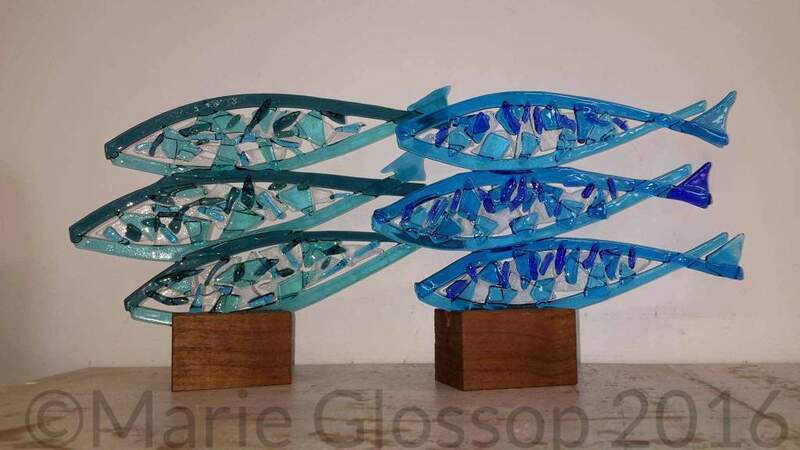 Reluctant to give up teaching, Marie invited other like minded artists to join her in operating the studio as an opportunity to work, exhibit and meet existing and new customers. 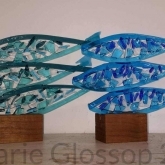 Marie relishes the opportunity to live where she can follow her own artistic inspirations strongly influenced by the love of striking and sculptural surroundings of the sea, coast, farm and moor land, fauna and flora around her and to encourage others to experience the benefits of creative expression. Any digital image including text can be used in the process. The results will produce a sepia (dark brown) effect once fired into the glass which is done in a kiln at high temperature creating a fade resistant piece of art work incorporating the photograph of your choice. 20cm x 14cm image on one layer of clear 4mm thick glass (25cm x 20cm total size) with wood plinth £25. Larger sizes are available up to 28cm x 21cm (image size) and glass size/colour as required by the customer upon request. Digital images must be of a good quality with a variety of tones and with definition between background and foreground. The image should be sent electronically to Marie in as large a format as possible (not compressed) and saved as either a .jpeg or .tiff file. A ‘pre-print’ image will be created and returned to your email address with the price (including postage and packaging if required) within 3 day for your approval. Upon receipt of confirmation and payment (either by cheque or direct transfer) the anticipated maximum completion time is approximately 2 weeks unless otherwise agreed. 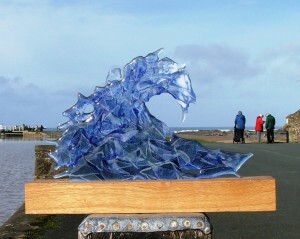 Postage is from £6.00 first class for one layer glass process and plinth. Postage rates for larger sizes available upon request. If you would like to visit Marie to discuss your requirements please check on the ‘Who’s in the studio’ list to the right of this page to see when she is in the studio. You can see examples of Marie’s work at the studio below, including her photo fused images and her other signature piece, ‘The Wave’. Please note that these are only a few examples, many more are available and new pieces added frequently but the pieces shown here may not be available in the studio when you visit. If you are interested in a particular piece or if you would like to discuss the possibility of commissioning a bespoke piece of artwork please don’t hesitate to contact Marie. You can also find her work in various galleries and craft fairs and she is very happy to take commissions.